In today’s China, if you’re a teenager and you’re looking for a job, chances are that you’ll have to travel hundreds of miles away from home to find one. 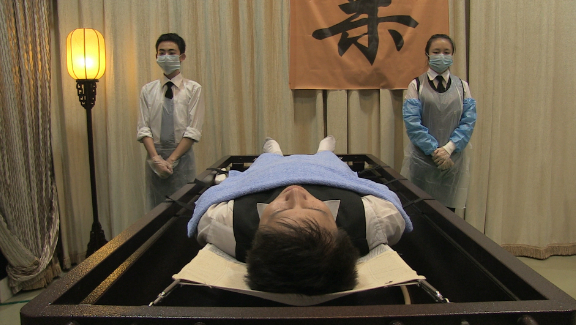 Such are the demands of China’s modern industrial approach to funeral homes, that even seventeen year old girls like Ying Ling will be hired as morticians, and taught the traditions surrounding the handling of the dead, while also acknowledging the commercialisation of the whole funeral process. For any young girl it would be a daunting prospect, but even more so when you’ve never been away from your family before, and getting back to see them is problematical. For Ying, alone and living in a sparsely decorated and furnished room (her bed is a thin mattress on the floor covered by a large blanket) within the confines of the Ming Yang Mountain Funeral Home, her occasional calls home are both wistful and disappointing – wistful for the sad reactions they prompt in Ying, and disappointing for the lack of support that Ying seems to be receiving from her family. 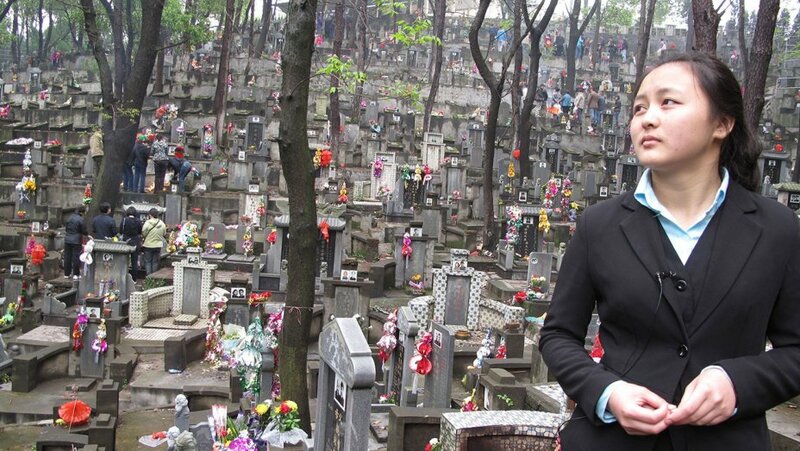 It’s no wonder that she feels isolated, and it’s no wonder she’s unsure if being a mortician is something she wants to continue with as a career. The funeral home is an austere, brilliantly lit yet empty building split up into several different areas, some of which are accessible to grieving families. For Western audiences, seeing relatives watch as their loved ones are washed and cleaned is a little unnerving at first, but Salter’s unflinching cinematography soon draws in the viewer and makes them (eventually) a willing participant. It’s fascinating, and it’s strange, but these traditions and rituals are ultimately about what’s best for the deceased, and their transition to the next life. As Ying learns more and more, so too does the viewer, and Carol Salter’s intuitive yet restrained direction allows those unfamiliar with Chinese funeral practices a greater appreciation and understanding of why these rituals are so important. Ying has her own reservations at first, and isn’t always paying attention, but the mistakes she makes are minor, albeit enough to make her question her long-term future; she has her own hopes and dreams away from Ming Yang, even if it’s only to have a small shop that sells milk tea. Salter catches Ying in various moments of repose and contemplation, and each time she looks melancholy and unsure of what to do. 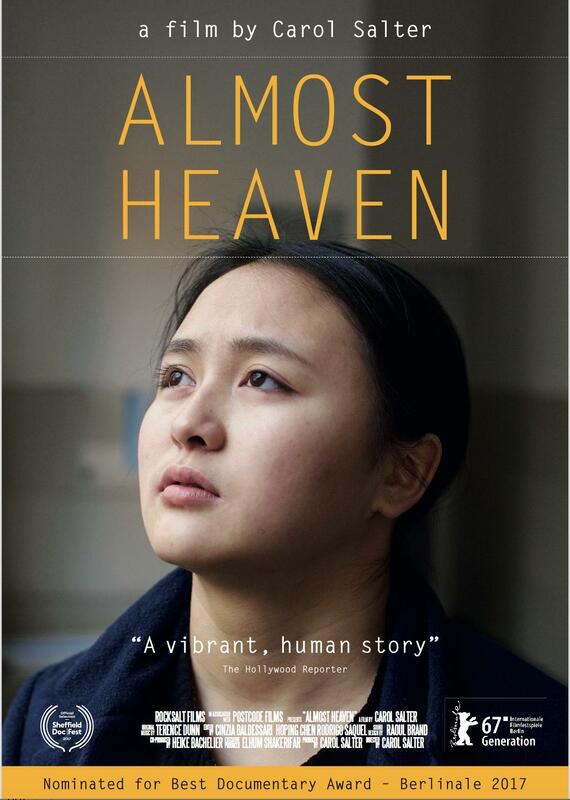 Rating: 8/10 – an elegant, beautifully rendered meditation on the nature of death amidst life, Almost Heaven is also a quiet, intimate documentary that addresses how life causes us to reflect on death; though for many this will be the antithesis of a must-see movie – for the subject matter alone – this is nevertheless a powerful and insightful foray into a world that would otherwise remain a mystery to many of us.